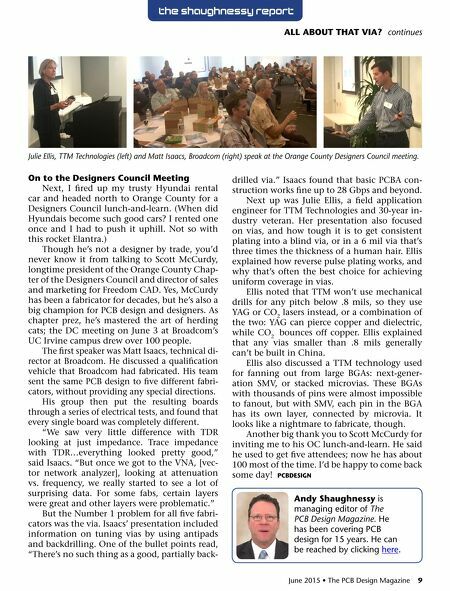 8 The PCB Design Magazine • June 2015 by Andy Shaughnessy I-ConnECT007 THE SHAuGHNESSy REPORT All About That Via? 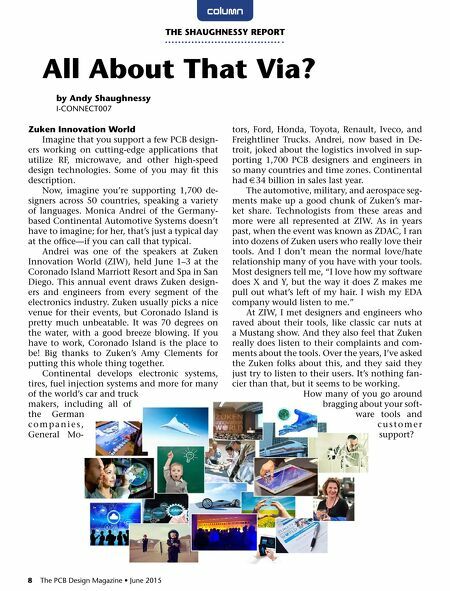 column Zuken Innovation World Imagine that you support a few PCB design- ers working on cutting-edge applications that utilize RF, microwave, and other high-speed design technologies. Some of you may fit this description. Now, imagine you're supporting 1,700 de- signers across 50 countries, speaking a variety of languages. Monica Andrei of the Germany- based Continental Automotive Systems doesn't have to imagine; for her, that's just a typical day at the office—if you can call that typical. Andrei was one of the speakers at Zuken Innovation World (ZIW), held June 1–3 at the Coronado Island Marriott Resort and Spa in San Diego. This annual event draws Zuken design- ers and engineers from every segment of the electronics industry. Zuken usually picks a nice venue for their events, but Coronado Island is pretty much unbeatable. It was 70 degrees on the water, with a good breeze blowing. If you have to work, Coronado Island is the place to be! Big thanks to Zuken's Amy Clements for putting this whole thing together. Continental develops electronic systems, tires, fuel injection systems and more for many of the world's car and truck makers, including all of the German c o m p a n i e s , General Mo- tors, Ford, Honda, Toyota, Renault, Iveco, and Freightliner Trucks. Andrei, now based in De- troit, joked about the logistics involved in sup- porting 1,700 PCB designers and engineers in so many countries and time zones. Continental had €34 billion in sales last year. The automotive, military, and aerospace seg- ments make up a good chunk of Zuken's mar- ket share. Technologists from these areas and more were all represented at ZIW. As in years past, when the event was known as ZDAC, I ran into dozens of Zuken users who really love their tools. And I don't mean the normal love/hate relationship many of you have with your tools. Most designers tell me, "I love how my software does X and Y, but the way it does Z makes me pull out what's left of my hair. I wish my EDA company would listen to me." At ZIW, I met designers and engineers who raved about their tools, like classic car nuts at a Mustang show. And they also feel that Zuken really does listen to their complaints and com- ments about the tools. Over the years, I've asked the Zuken folks about this, and they said they just try to listen to their users. It's nothing fan- cier than that, but it seems to be working. How many of you go around bragging about your soft- ware tools and c u s t o m e r support?